Looking to back up essential elements of your business? Consider the Protector Series gaseous generator line. These units power sensitive business technologies and appliances during power outages, providing profit protection for businesses. 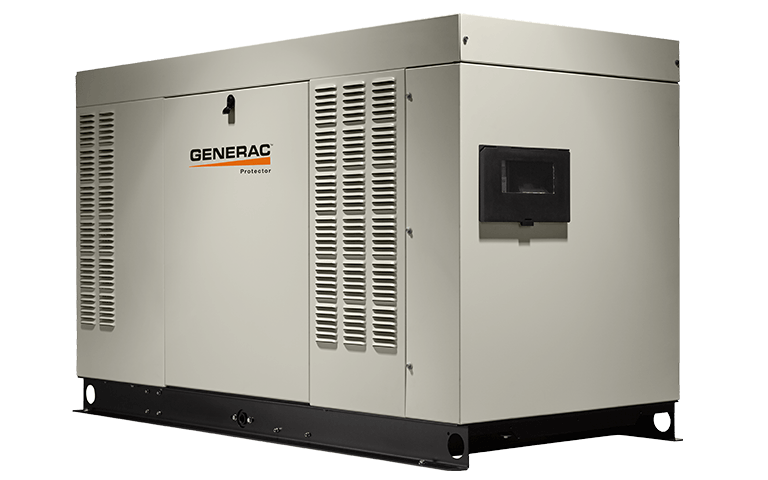 Generac’s Protector Series offers benefits that competitors can’t match. Installation flexibility and cost reduction. Sophisticated, yet intuitive controls. Quiet operation. Supported by a 24/7/365 customer support team at our corporate headquarters, and a nationwide dealer network of more than 6,000 strong. The best liquid cooled engine packs more power into a smaller footprint – ideal when space is a premium. The neutral styling, color and small footprint fits unobtrusively into landscaping. Clean burning, continuous fuel choice of natural gas to LP. Delivers best-in class power quality with less than 5% total harmonic distortion (THD) for clean, smooth operation of sensitive business electronics and appliances. 5-year limited warranty, with extended warranty options are available. Aluminum enclosures provide enhanced durability, and are corrosion resistant – ideal for businesses located in coastal and salt-ware environments. Mobile Link is the cellular remote monitoring system from Generac that allows business owners to check the status of their generator from anywhere in the world, using a computer, tablet or smartphone. Improved customer connection access will decrease installation costs.